If I had a dollar for every time I heard this statement growing up, my entire wedding and honeymoon would have been bought and paid years before the actual event. While I do think it's endearing, I also think it's crazy. When I was a little girl, I never dreamed about my wedding. I never thought about the flowers, the dress, the decor, or even the cake. Oh, I've thought about cake, but never wedding cake. There's a big difference, friends. I never dreamed about the guy nor did I have my best friend officiate a mock wedding with me marrying the family dog. My dreams were bigger than one day. I often fantasized about the places I would go, the cities I would conquer, the interesting people I would meet along the way and, when I was about fourteen, it was also the food I would consume. Prince Charming et al were the furthest thoughts from my mind. Please understand, I'm certainly not saying it's wrong to put some thought into one of the most magical days of your life. It's important to dream and by all means, do what makes you happy, but I personally feel it's a lot of energy to spend on something that takes months to plan and is over in less than 24 hours. Oddly enough, I do love a good wedding. I'm often attracted to weddings that have a bit of an eclectic flair or are far from traditional - lakeside ceremony at dusk surrounded by a million twinkle lights, rustic barn on an apple farm with a country band playing on haystacks, a carnival-themed wedding with authentic fair food. Regardless, nothing fills my heart more than seeing the couple's personalities imprinted everywhere from start to finish. I'm especially overjoyed when I come to find the couple has written their own vows. The waterworks start and the mascara runs before they have even uttered the first word. Something about a couple declaring their undying love in the form of poetry turns me into an weeping, emotional sap. This past weekend, my husband and I attended a wedding. The entire day took place in a gorgeous, old converted church in a downtown setting. The ceremony was upstairs; the reception was down. It was the type of building with history so rich, I almost wished the walls could talk. Old, creaky wooden floors well past their prime, walls with mortar and stone rather than bricks; stained, lead glass windows with abstract depictions on them, and solid oak doorways with an arched point at the top of each. The bride was a vision and the groom was exquisite in his own unique way. It was nothing short of lovely and they should be so proud to have executed it as such. It was beautifully them. Unfortunately at every wedding, there's always those few that will bend the rules and manage to make the other guests shake their heads. Take a wedding we attended in 2012. A guest thought it was perfectly acceptable to leave her phone on during the entire ceremony. She had it turned down, but it was still loud enough for those of us in ear shot to hear the incessant beeping of messages and emails coming in every 30 seconds for 45 minutes. Let's not forget the 2009 wedding where a very late couple walked in as her bridesmaids were already walking down the aisle. They have forever ruined their wedding video. Of course, there's always those that think an open bar is an actual sport rather than a spot to grab a liquid refreshment or two. I never understood the need to drink myself blind and not remember any of it come morning. I want to remember my friend's wedding. And I certainly don't want to make a fool of myself by doing something I may regret. However, nothing is worse than those that break the number one cardinal rule of a wedding. NEVER WEAR WHITE TO A WEDDING. EVER. In fact, and to be safe, steer clear of all shades of white. A friend once said it best, "I get nervous wearing a dress with over 50% white on it!" I've been to a couple weddings over the years where someone had pushed the envelope with their wardrobe choice, edging dangerously close to inappropriate, but nothing like I saw recently. There was a woman that not only wore white, white ladies and gentleman, her dress was strapless, had ruching on the bodice, and was made of flowing chiffon. It was shocking. I mean at what point do you go shopping for a dress, choose one that could very easily pass for a wedding gown and declare, "Yes. This is the dress I'll wear to help celebrate the special couple!"? Is she trying to upstage the bride? Is she that desperate for attention? Not that I can justify either of those options, but I truly hope it's not a case of complete ignorance, because Lord help her. 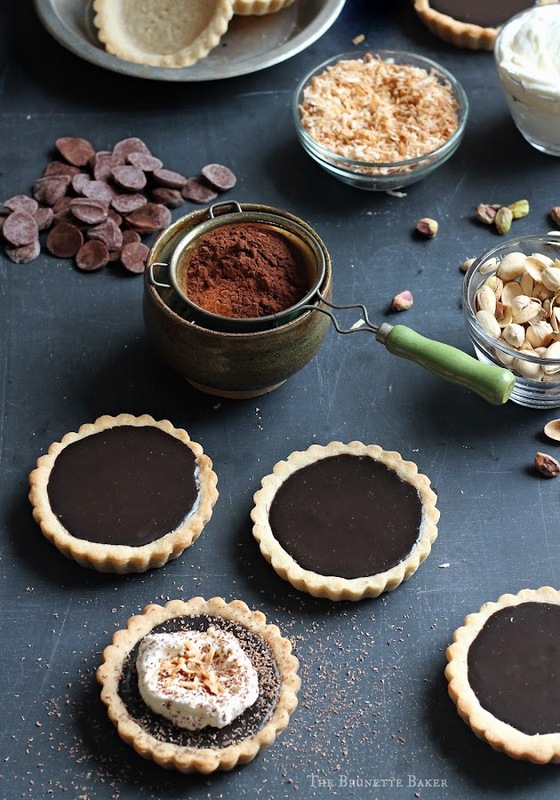 Although I thought it was unfair, I shut my mouth, danced with my husband, and couldn't stop thinking about these gorgeous chocolate tarts we saw in a bakery on the way to the wedding. I know. I am so random. 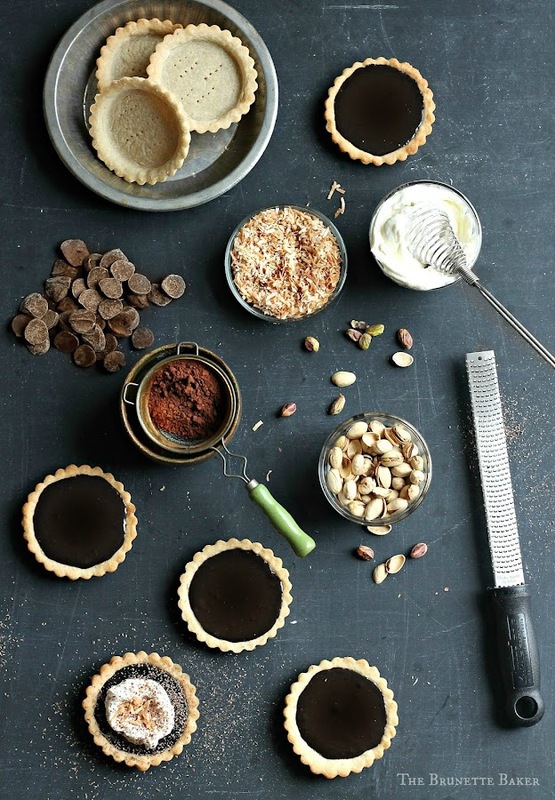 But friends, it was chocolate - and chocolate tarts no less, much like the ones I have created. I didn't have a chance to pop in and try one, but I assume if they're anything like mine, they're amazing. Although, if I eat one more, I'll turn into a tart. But at least I won't be wearing white while doing so. In a large mixing bowl, using an electric mixer, cream butter and sugar together for 2 minutes. Add in flour, salt, cardamom, and vanilla and mix until a soft dough forms. It will be crumbly, but will come together nicely. Gather dough together and form a disk. Completely cover with plastic wrap and place in refrigerator to allow proteins to relax - for about 30 minutes. Preheat oven to 350 degrees F. Press dough into tart pans and prick with fork. Line with foil and add pie weights or a similar substitute. Bake for 15-20 minutes, checking as early as 12 minutes as ovens vary in temperature. After specified time, if foil sticks as you pull back to check, it's not fully baked. Allow to bake longer, but be sure to check every 2 minutes. Once foil no longer sticks or crust starts to take on a golden brown colour, they're done. In a medium saucepan away from heat, whisk together sugar, cornstarch, and salt with ½ cup of milk until smooth. Whisk in egg yolks and remaining milk. Place saucepan over medium heat, whisking constantly and scraping down sides of pan. It's very important to constantly whisk during this time as the eggs can and will scramble and you will have to start over. After roughly 6 to 8 minutes, mixture will begin to thicken. Once filling starts to bubble, turn heat down to a simmer and continue to cook for one more minute. Remove from heat and immediately add in chopped chocolate, butter and vanilla extract. Stir with an silicone spatula until chocolate and butter have completely melted and filling is a smooth consistency. Pour chocolate filling through a sieve into an empty (glass) bowl to remove any lumps. Place a piece of plastic wrap right on top of filling to prevent a film from forming. Allow mixture to cool at room temperature for 20 minutes. Pour into cooled, pre-baked shells and refrigerate for at least 2 hours. Once crust is completely cooled and filling is properly chilled, spoon filling into crust, levelling with an offset spatula. Place pies back in fridge and allow to fully set, about 4 hours. 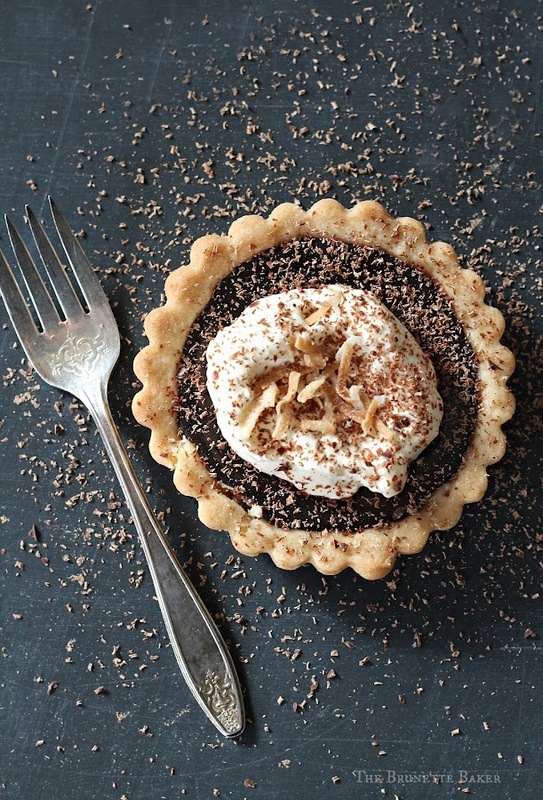 When ready to serve, spoon or pipe whipped cream on top and embellish with chocolate shavings, toasted coconut, or sprinkles if you so desire. Pie will keep in refrigerator for up to 3 days. I hate weddings, bridal showers, bachelor/bachelorette parties, engagement parties, rehearsal dinners, wedding receptions, those gift opening events after weddings, baby showers and children's birthday parties. This post is so accurate!! I can't even deal with some people at weddings! Like, it's not about you, you know! If the shoe was reversed and it was their wedding, these same people would probably lose their minds! Gorgeous tarts!! I'm going to have to make these soon! !